No, it's not your boss. It's your pile of crap. A lack of functional and attractive office space might be cluttering your brain more than you think, and in turn, making you more unproductive and unhappy. Invest in storage like filing cabinets, whiteboards or chalkboards, and desk organizers to keep everything neat and tidy. This will encourage you to keep organized and in turn boost productivity. Once your office space is optimized with the basic functional furniture you need, then you can focus on adding the little inspiring touches that will really bring your work space to life. 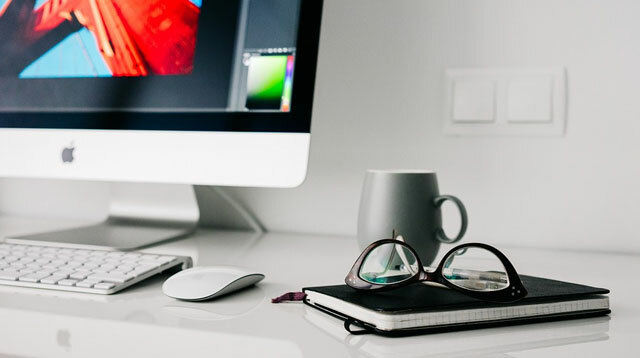 It's no surprise that your desk layout and where it falls in a room can impact your mood, too, which is why you should consider positioning and formatting. If your desk faces a wall, arrange it so that you have a window view instead–it will help to offer some relief from staring at a computer screen all day. Plan so that you're working in the quietest spot–such as away from an adjoining room or the hallway. As you'd expect, working in a dark space could leave you feeling tired and uninspired. Lighting can make all the difference when it comes to boosting creativity, so invest in lamps, lanterns and other lighting to brighten the space if natural light isn't possible. Arrange plenty of mirrors around the room to reflect any natural light you do have. Additionally, consider painting your office space in a pale pastel shade, which will instantly make the whole area feel lighter and conducive to efficiency. A dreary, boring desk space could also be the reason behind your bad moods, because while style and inspiration may not be at the forefront of productivity, a space designed to encourage innovation and imagination can have an incredible impact. Brighten up your home office with creative artwork as well as objects and accessories. Adding pieces such as paperweights in bright, bold colours will give you the added comforts you need for a home office. If you feel like you're stuck in a rut at work and kind of dread sitting at a desk all day, it might be because you've put no character or personality into your area. Throw the rule book out and style a home office that challenges classic ideas of how a study space should look. Swap out the classic wheeled design for an accent chair, choose a statement base to jazz up your task lamp and pepper your bookcases with statuettes, bookends and art pieces that make you smile. The key to this look is in the personalization—style a space that inspires you and don't care a jot what anyone else thinks! Think about the actual amount of space you're using, and whether the piles of clutter you've got going on are a cause for strain on your mood. If you're working from home, dedicate a work station in your room by using an area rug or invest in room dividers—a brilliant tool for creating a sense of privacy. Think about corner-shaped bookcases, chests, and desks to organize an inspirational spot while also saving you space.